Yeah! Great work, have always been wanting to dive deeper into computer vision, but with no time to venture away from Processing. I’m looking forward to check it out! Wondering if there is any plan to add the blobs() functionality from the ubaa lib ? or an alternate method to roll our own with your lib? The current Contour api is very similar to that: https://github.com/atduskgreg/opencv-processing/blob/master/examples/FindContours/FindContours.pde It finds shapes in an image and represents them as a series of points. There’s no actual concept of “blobs” as such in OpenCV itself. I think people usually use that term to refer to code they add on top of the OpenCV contour tools to add things like persistence (heuristics for guessing which contour is which from across sequential frames). I am planning on adding some code like that. Do you have any advice for integrating this libs in Eclipse, my question focuses on the native lib integration to run the application in the Eclipse IDE and to make export runnable Jar ? wow looks very nice … gonna run some tests now … im very interested to see how fast it is. Anyway do you think that the 3d calib methods allow to calculate homographic transformation like extrinsics and intrinsics between a projector and a kinect? You should look at the RGBD Toolkit project. They do exactly that. https://github.com/obviousjim/RGBDToolkit I haven’t wrapped most of the related methods (just started with the chessboard detection), but you can call anything that’s available in the OpenCV Java API yourself, so you could definitely do this following the RGBD Toolkit example. Thanks! I’d love examples, especially in this area as it’s not something I work with frequently, but it’s an exciting and import part of what OpenCV can do. We got this sorted out on Github, correct? It was a problem with how you’d installed the library. Great news for all Processing users. I already tried it with OSX two weeks ago, but back then windows wasn’t supported yet (so I had to do work arounds with the native lib as presented by Joshua Noble: http://thefactoryfactory.com/wordpress/?p=1093). But compiling those libraries is not something that fits (or should fit) in the mindset of the average Processing user. Do you plan 64bit Windows as well? Windows 32-bit support is working great now. I’d love to do 64-bit support as well but I don’t currently have access to a 64-bit windows system. Pull requests welcome! @Ashley Brown: Make sure you have Processing set to run in 64-bit rather than 32-bit mode. There’s a setting in the preferences and you’ll have to restart Processing. @Kasper Kamperman: I’m not sure if the Windows-build of OpenCV included 32-bit binaries. I’ll double check and if it does I’m happy to support it. If not, I’d need the help of someone who’s more expert at building things on Windows to create those binaries. “I’m not sure if the Windows-build of OpenCV included 32-bit binaries”. You mean 64-bit binaries I suppose? Since 32-bit is supported by your library. See also the comments I’ve made in the URL (factoryfactory) posted in my 1st commend. i figured it out. i had move the data file out of the library and into the example folder of openCV. I’m also getting the “Cascade failed to load” message. I’m using Windows 7 (64bit). Should be fixed as of the most-recent 0.4.1 release. I’m getting the following error: “No library found for gab.opencv” when attempting to run any of the examples on a mac pro running Processing 2.0b8 under os 10.8.4. the folder created after the download unzips is called “opencv-processing-0.4”. Is this the proper name for this library folder? Wonder if this would work better on an older (2 years old) laptop with the latest version of processing? Did you move the library folder into your Processing libraries folder? You can find the location of that folder by looking in the Processing preferences. Once you’re moved the opencv-processing folder into that directory, you’ll also need to restart Processing before it recognizes the library. For information, the macos export with PDE don’t work for LiveCamTest.pde. By the way in a previous reply i wrote about Eclipse : i succeed to load the native libs, but didn’t succeed to load the cascade file. For information, i worked on this project, the last weekend and i made some optimisations. > I noticed that the 32bit version didn’t work on macos : i refactored the native lib forlder to have a macos64 and a windows32 as inticated in the processing wiki. Do you want i fork the prject on github with this update ? Am having the same ‘Cascade failed to load’ with windows 7 and Processing 2.0.1 – 32bit. Can you clarify your work around? I am unfamiliar with the appropriate syntax for loading the “haarcascade_frontal_face_alt.xml” directly and would like to try that at least…Thanks. Thanks for the pull request! Integrated! Much appreciated! It would be awesome if this would work on Win 64-bit. Looking forward to that update. I have installed it (Windows 7), but when I try to run one face detection example sketch, it can’t find the gab library (“no package found for gab.opencv”). Any clue, please? This is fixed as of the 0.4.1 version. The library 0.4 is compatible with which version of the Processing? And will be added to library “SURF”? I’m having a lot of trouble to develop a detector objects with javacvPro. *Windows Vista Starter 32 bits. This library should be compatible with most versions of Processing (besides the few versions around the 2.0 release that have the pixels bug mentioned in this post). It works great with the current version of Processing which is currently 2.0.3 as of this writing. I haven’t wrapped any of the SURF (or other feature tracking) functionality yet, but you can use anything available in the full OpenCV java api: http://docs.opencv.org/java/. The first time I run the project it grabs the camera and every time I restart it locks up and can’t find the camera again until I unplug it and replug it back it. Any thoughts? Does that sound like more of a processing issue? Yeah OpenCV for Processing isn’t involved in accessing the camera. Maybe try Processing 2.0.3. A lot of bugs got worked out in those first two sub-point releases. I use Processing 2.0.1 32bit on Windows 7. Most of the examples work fine. But the FaceDetections states the error “Cascade failed to load”. Anything I can do about it? That issue should be fixed now. Try version 0.4.1 or anything more recent. Anyone else with this problem: No library found for gab.opencv ? Using the latest os x, processing, opencv. Have you installed the library successfully? Do the OpenCV for Processing examples appear in Examples > Contributed Libraries > OpenCV for Processing? Do the examples there run? Get ready for a clanger of a noob question. Do I need to install openCV to be able to use this library in Processing? Like, do I need to install this http://opencv.org/ ? Apologies for asking a silly question. You don’t need OpenCV installed to use this library. You just need to install OpenCV for Processing successfully in your Processing libraries folder and it will do the rest. Not a silly question! One of the important goals of this project was to include the OpenCV binaries within itself so that it would be simple to install and not require you to build OpenCV yourself. I’m new to both Processing and opencv…..
Is there a trivial solution to this situation or will this problem be addressed in a following release? I don’t have a 64-bit windows build of OpenCV to include in the library as I don’t have a 64-bit windows system to make it on. That would make a great contribution from you or someone else. If else made (or found) the correct binary, I’d be happy to include it in the library. Pull requests welcome! how does one have a different display resolution from the opencv resolution? plus have it flipped to be more of a mirror. For that case, I’d recommend capturing the video at its full resolution and displaying it at the resolution. Then, each frame, after you’ve displayed the video, you can resize it before passing it into opencv.loadImage(). You’d create your opencv instance at the smaller size and only process the resized smaller image. Really great work so far. I tried javaCVpro. But the amount of memory leaks is way too high. I also like that your library is stand alone and doesn’t require openCV to be installed. I really would like to see some high level functions implemented. For starters in computer vision (like me) they lower the complexity a lot. (“blob detection”, Image recognition based on SURF ..). Thanks for your work and for sharing the results. Thanks! Yeah, the JavaCvPro guys were in a bit of a hole because while JavaCV is based on OpenCV 2, they still use the old pre-Mat data structures which means they have to do memory management manually. Since I use the official OpenCV Java bindings I get to use Mats which are memory managed meaning I don’t have to worry about leaks much (in fact the old pre-Mat data structures aren’t even available in the Java API). you say that : There’s a known bug with the paths to the cascade files on Windows that I still need to figure out. I do not know that you r taking about ??? That should be fixed in the most recent version. Make sure you’ve got 0.4.1 or more recent. That should be fixed with the most-recent version, which corrected the loading of the cascade files on windows. I’ve found a bottleneck with loadImage() that reduces frameRate in Processing when you have to process an image in realtime. That happens here, when you convert the PImage to CV format. Is there any way to make this conversion more efficient? * Convert a Processing PImage to an OpenCV Mat. * The PImage to convert. * The Mat to receive the image data. Well that “bottleneck” is that the pixel data needs to get moved inside the PImage’s BufferedImage. It’s not a bottleneck so much as the actual work that’s being done. Since Mats are only headers for existing image data (and that image data is already in memory inside the BufferedImage somewhere) it should theoretically be possible to create a Mat in place without copying the pixel data. This is how the process works in C++, for example in Kyle Mcdonald’s ofxCv. However, I don’t know of any way in Java to access the actual memory location of the image data, either to get that location within the BufferedImage or to set it within the Mat. I’m not the world’s most advanced Java programmer though, so my lack of knowledge of such a method is not proof of its non-existence. I’d be glad to hear of a way to accomplish that, but I couldn’t find one in my research and no one else I contacted knew of one. I just started a project in which I would like to detect two markers on an object and calculating the object’s angle from that. However, I am facing problems in learning how to use the OpenCV library. For example: Which arguments does startBackgroundSubtraction() take? What would you recommend if I want to learn more about the different functions and objects in the library? I am aware of http://docs.opencv.org/java/, but I can’t seem to find information regarding specific functions (also, it’s vast!). I’m working on better docs for the library as well as a series of tutorials as part of my book on this topic. For now you can follow my progress here: http://github.com/atduskgreg/opencv-processing-booka>. Ok, Greg. I’ll follow your progress. Thanks! How can I install it in Ubuntu 12.04 32 Bit. 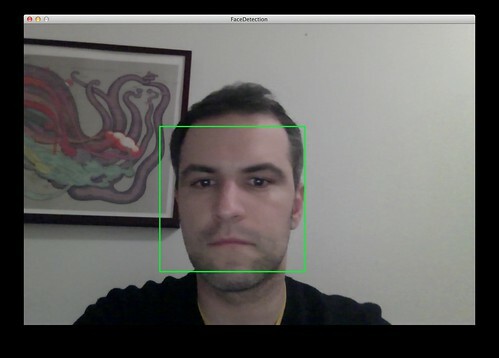 I already have openCV installed on my system with openCV for python by building it from source. I already have OpenCV with python support installed by building from source. I’m trying the “depth from stereo” example and was egar to try it out with realtime video. SO I plugged in one extra webcam and placed it at a side of the Integrated cam at 2.5 cms(for stereoscopy) and first figured out a way to pull in two videos from two webcams at the same time in processing. Then I wrote this code and it’s not working(expected to some extent). 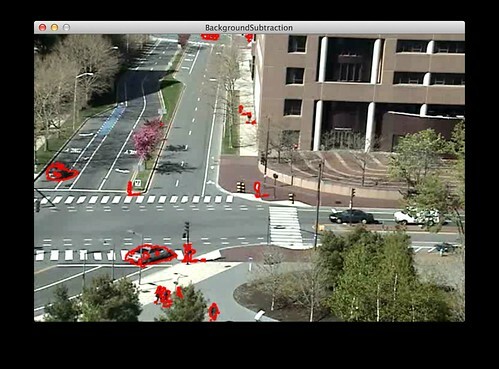 This is an advanced example that mainly uses unwrapped OpenCV functions. You should read the documentation of the relevant functions: http://docs.opencv.org/java/org/opencv/calib3d/package-summary.html. Mat is the OpenCV type for representing image data. I’m accessing the mats for each of the two images: left and right. Then I create a “disparity map” which is an image that contains data about how the left and right images differed so as to calculate depth data. Then I configure two different OpenCV objects for calculating that depth data, StereoSGBM and StereoBM. Each of these implements a different algorithm for calculating the disparity map with a different approach and a different trade-off between quality and performance. Then, after calculating the disparity map, I load the pixel data back into a PImage to display it in Processing. The other functions there are about setting up the right size and types of Mats for the image data and converting between the various types. “No library found for gab.opencv”, no difference how I try to link it. Tried both MacOS and Win32. Did you install the library in your Processing libraries folder and restart Processing? Are you seeing the built-in examples when you look in Processing’s Examples > Contributed Libraries section? Yes I see it in the lib list. Yet the examples don’t work with “No library found for gab.opencv”. OpenCV for Processing is in the early stages of development. Currently it only supports Mac OSX and 32-bit Windows. Linux (and hopefully Android) support coming soon. I found older github commit where were more info, and tried everything from there as well, but no luck. I’m now having the same problem, having finally figured out how to rename the library and .jar files so that Processing can find them. Mac OS 10.9, Processing 2.1. You don’t need to rename anything in order to install the library. Just download the archive linked from the releases page, unzip it, move the folder into your Processing libraries folder (you can get the path for this by looking in Processing’s Preferences menu). Restart Processing and it should show up. If you’re renaming files or moving just jars around, you’ve gone off the rails somehow. @Aleks: It sounds like maybe you’re working in Eclipse rather than the Processing IDE. Is that correct? Awesome work! It looks like OpenCV for Processing is optimized for 64-bit Mac OS X with Mountain Lion and Lion and 32-bit Windows 7. Do you have any suggestions on how to get it to work on 64-bit Win 7? will this support android mode ? is a topic on OCR possible…in your upcoming book ? That’s a weird error as OpenCV for Processing doesn’t use any shaders. What version of Processing are you running and what other code are yo using? Hi, thanks a lot for this library, finally wrapper for the new versions of openCv. I have one question though, I want to use it for motion detection so I am using the background subtraction. However, the result picture from your library has the past motion (white color) dissapearing very slowly (in opencv for openframeworks, the output image had only the most recent motion in it) . Any fix for this? Thanks for help. Try passing in different arguments. They are, in order: the history, number of mixtures, and background ratio. Hi, is there any way to export sketches using opencv as applications? So far I’ve had no luck. Hi, Pierce. I’ve never tried exporting sketches with the library. I don’t really ever export sketches in general. Can you tell me more about what errors you’re seeing? I’m modding the LiveCamTest example. The webcam video is drawn, but the face detection never gets called. I thought it was just something I did wrong, but the clean FaceDetection example also doesn’t draw the green box when I export the sketch. The fact that terminal only said that the cascade file failed to load makes me think that the opencv library is being imported fine, and that the problem lies in how the cascade file is linked. I tried replacing “OpenCV.CASCADE_FRONTALFACE” with “../data/haarcascade_frontalface_alt.xml”. I also tried using Contents/Resources/Java/data/haarcascade_frontalface_alt.xml. No luck yet, but I’ll keep trying. What platform are you on and what version of the library are you using? Before 0.4.1 there was a bug in the file path-generation on Windows that prevented cascade files from loading. That bug has been fixed for the last two releases. If you’re on Windows, try the most recent release and see if that fixes the problem. It works! Found out it was multiple problems entirely on my end. Turns out I had several versions of the library installed and it was defaulting to the older one. I got it export fine in Processing 2.0.3. Version 2.1 is still a mystery, but i like 2.0.3 better anyway. Thanks so much Greg! Absolutely no problems running Processing 2.1 (x86) Windows8 (64bit) with your OpenCV library. Great work! Having the same problem as many above with gab.opencv. Using Mac OS 10.9 and Processing 2.1. The funny thing is that I can’t even get Processing to see the opencv-processing-master folder in the library folder at all, even after restarting. It sounds like you’re downloading a zip of the entire git repository rather than the actual released library. Go to this page: https://github.com/atduskgreg/opencv-processing/releases click the green download button on the topmost release (at the moment that one reads “opencv_processing-v0.4.1.zip”). Unzip that archive. Move the folder into your Processing libraries folder (which will be inside your sketchbook location which you can find out by looking in Processing’s Preferences). Restart Processing and then the OpenCV for Processing examples should start showing up under File > Examples > Contributed Libraries. Try running one of those. Greg, thanks! Everything works like a charm now. I am attempting to combine the examples with live camera feed and seem to be doing something wrong, I just get blank screen. Could you glance at my code? Thanks! Is it possible to have a markerless AR on colourful images with this library? Hiya and Thanks! At the top of this page the “Download it here” link points to the .4 release not the latest release….. maybe why there are so many cascade file loading errors reported. Thanks! Just updated it to always point to the most-recent release. A library used by this sketch is not installed properly. I don’t have access to a 64-bit windows machine to debug. I’ve made a build that I thought should work on 64-bit windows, but doesn’t. If you want to try it out, you can download it here: http://gregborenstein.com/assets/opencv/opencv_processing-win64.zip If it doesn’t work and you provide useful debugging info, I might be able to fix the problem. Thanks. I am helping my son with a project using Kinect + Processing 2.0 and the OpenCV for Processing library. I am using windows platform and the 32 bit environment for processing, kinect and opencv. We found an example on the web for blobs which has the following statement: import hypermedia.video. *; When we run this Using OpenCV for processing the program crashes. When I search for hypermedia in the subdirectories in OpenCV for processing I can’t find it. What is needed in the install to do this? I also downloaded just openCV and there I can find the hypermedia in the src directory. I am a novice at this stuff. Any help appreciated. Hi everybody, I have a Kinect for Xbox 360 and I have to realize a software for an exam in my university. With the software I should recognize the shape of buttons in a washing machine with coordinates and distances from kinect sensor because in future a robot arm will push that buttons. 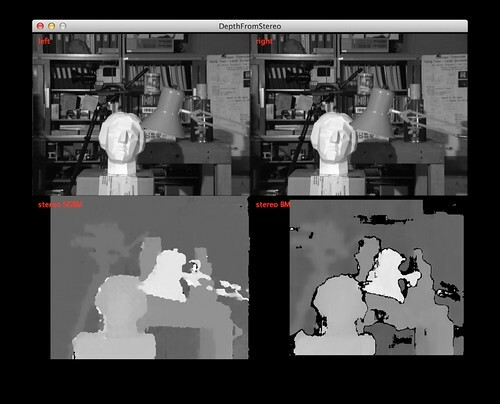 I’m thinking to use my Kinect with OpenCV for Processing to detect and track shapes of object using contours. Is it possible?How can do that? In the library examples I have found an example with webcam but nothing with other types of camera. Thank you very much and very compliments for your effort! My interest is to build Robot Platforms. You can see what I do on my blog. I just started to work with Processing to evaluate if this tool allows me to create Win & Android Programs. Then I found openCV and your site. My vision is to use an Android device as a “sensor collector” or as the brain of my units. And for that I need your help: I’m looking for a openCV module that allows odometry. The idea is to use one of the Android photo camaras as a flow camara to measure 2D movement (x,y, Turn). Then, based on that information, and using the incorporated compass, use the android device to track movement. Do you have any example / link / hint on how to do this? Would you evaluate to incorporate this feature in your next book? Optical flow is supported in OpenCV including in the Java bindings. It’s part of the Video class. You can read the documentation here: http://docs.opencv.org/java/org/opencv/video/Video.html All of those functions will work fine with OpenCV for Processing. I haven’t worked much with optical flow, but it is something that I’d like to support in OpenCV for Processing, both in the wrapper and as an example. I probably won’t have time to work on that until this coming summer, but I’d be more than happy to accept a contribution with a basic sketch if you wanted to try it out. I’d even be glad to help debug and get something working if you started to work and got stuck. You need to install the library. Try doing so using the Library Manager or Google for more thorough tutorials. Hey, thank you for bringing awesome content to the internet. I am trying to find a way to estimate pitch and yaw of the FRONTAL_FACE while I am running a processing sketch much similar to LiveCamTest example. Hello Greg! Congratulations for your work. Not annoyed at all. I just can’t respond to all the comments every day. Have you tried installing it from the Library Manager again since then? I had pushed a bad release around then (accidentally forgot to upload the actual library file! ), but I’m pretty sure it’s fixed now and has been for awhile. Sorry you caught the library at a bad moment. I’ve been playing with the library — nice work. Of course, once you get into much real at all you need to go beyond the library. It would be *VERY* useful if this library provided a few methods similar to the OpenCV Android Utils. * methods. This would work similar to Utils.bitmapToMat and matToBitmap, providing easy conversion between mats and pimages. You have much of this code right now (e.g. toPImage), but it’s unidirectional and the other method operates on private members and is not accessible. Simply refactoring that to be accessible would be a huge time save for new users. Overall this is great work – and I’m sure lots of people (myself included) are going to get a leg up from this. This library does provide exactly those methods: OpenCV.toPImage(Mat m, PImage img) https://github.com/atduskgreg/opencv-processing/blob/master/src/gab/opencv/OpenCV.java#L819 and OpenCV.toCv(PImage img, Mat m) https://github.com/atduskgreg/opencv-processing/blob/master/src/gab/opencv/OpenCV.java#L854 OpenCV for Processing was designed for advanced users in exactly the way you’re describing: to make the Processing-related stuff easy, to automate the common stuff, and to make it seamless to the entire official API. Can you test with a 32 bit version of Ubuntu and tell me if it works on your end? Thanks and I look forward to your new book! I didn’t actually build either of the Linux versions as I don’t currently have a running Linux system. Those were contributed by Arturo Castro: https://github.com/atduskgreg/opencv-processing/commit/452390e3fa744952f560ec71851aa785c4eb80fe https://github.com/atduskgreg/opencv-processing/commit/19ba79b1ce052d835d74b6a96fc932780dc7c8a5 But I have heard from a number of people (both in the comments here and in issues on Github) who’ve gotten it working on both architectures. Have you tried other libraries that support both 32- and 64-bit operations on your version of Linux? One is the HueRangeSelection and the other is the Background Subtraction. Dan — Is this on Linux? Are you running the most recent version of Processing? It sounds like a bug that would occur if Processing doesn’t populate the CPU memory for the PImage (which used to happen for awhile back in the early 2.0 releases). If you’re on an old version, try upgrading to the most recent version of Processing. but still it says ??? now its working fine their were mine mistake that I were were using Processing 32 bit with Open CV 64 bit,,, thanks @GREG for your support. one thing more which I would like to ask is do you have some idea about TOBII eye tracker is that open CV gona work with Tobii Development kit or ??? Never heard of Tobi. What is it? and then run normal opencv functions after that.